This small book is full of big ideas. Now in its Fifth Edition, with over 15,000 purchased by sales people around the world since 1995, it has reached the rank of best sellers in Canada. 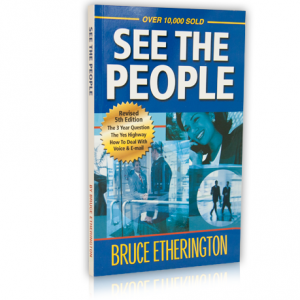 It focuses on how to find quality people and get in to see them when others can't, this simple, straightforward, focused book shares with you Bruce's actual process for finding an abundance of quality prospects and being able to get into see them when most other sales people cannot do either. “See the People” is absolutely guaranteed to change the quality of the people you see, the frequency with which you see them and the manner in which you conduct yourself therein.